In the age of Internet and globalisation, consumer demands for customised and unique products are pushing manufacturing companies to adopt flexible manufacturing practices. Consider the case of eyewear ecommerce that requires several workers at the production line to build thousands of eyeglass frame variations for customer choices that evolve on a daily basis. A traditional industrial automation system can’t possibly offer the flexibility to meet changing customer demands at scale and speed. As a result, organisations can avoid unplanned downtimes, improve the performance lifespan of machines and maintain productive manufacturing operations. To enhance human engagement, the smart factory of tomorrow will enable robotics control through smart glasses and augmented reality. For example, robotics combined with augmented reality can help in remote technical assistance, bringing engineering expertise to troubleshoot on the robot when they are not able to be present physically. Epson’s Moverio wearable smart glasses leverages augmented reality to project what onsite engineers are seeing instantaneously, to help diagnose and solve issues without being at the site. Proliferation of AI means that robots can be collaborative, intuitive, self-monitoring with human-like characteristics, and are no longer acting as “blind” systems led by fixed hard-coded software programs that may not account for unexpected human presence nearby. This philosophy aligns with Epson’s vision of intelligent robotics technologies and sophisticated sensors designed to seamlessly support smart factories in the Industry 4.0 era to achieve high efficiency through autonomous control and synchronisation. Progressive manufacturing organisations lead the industry with their ability to adapt production capacity and fulfil market demands that change on a continuous basis. With artificial intelligence, systems can analyse market data and robotics performance to make key decisions on demand and supply. As a result, they can always stay ahead of the competition and prepare for abrupt changes in market demands to maximise profitability. AI and robotics hold unprecedented value for next generation of the manufacturing industry. For manufacturing organisations looking to stay relevant in the Industry 4.0 era, early adoption of advanced intelligent robotics technologies is critical to accelerate growth in the age when businesses increasingly compete on grounds of innovation and their ability to adapt to market demands. 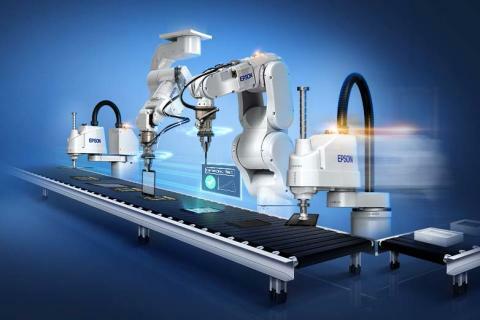 Epson provides a range of compact robots with flexible positioning, and is equipped with intelligent force sensors and vision sensing options – providing factory automation solutions from adjustment to existing lines to embarking on the automation journey. Find out more about Epson robotshere.